Today I am excited to talk about a very important and special 5th Chakra or energy centre called The Soul's Gate. Gate to which the soul travels, from the throat its azure light connects to the Jade Gate, our 1st Chakra, allowing advancement of the soul. This 5th Chakra, located in the throat allows our expressive abilities. 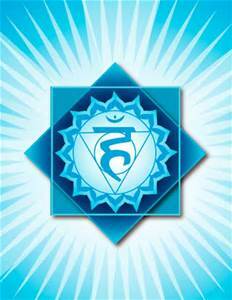 The quality of our speech, negative or positive indicates the state of this chakra. Everybody needs a voice, in relationships and in politics and internally as we develop our inner voice that guides us through life. Learning to develop, express and listen to this voice brings our 5th chakra to full expression. The voice allows us to express our divinity to the world, again, the negativity or positivity of our speech is a primary indicator of our spiritual health. When we express our desire and intention to make a difference in the world, we have made a huge step toward doing just that. It is also through our voice, through music, poetry and oration that we can touch the hearts of those around us. When this chakra is blocked or undeveloped, the person may be shy and unable to express themselves clearly. Often this is the result of self judgement or fear of judgement from others and unfortunately this lack of open communication results in more problems, leading to more judgement and guilt. When this chakra is overactive, the person may be loud, overly opinionated and crass in their speech. Spiritual development begins with the development of the fifth chakra. Before I sign off, I would like to say thank you to my readers for following my blogs and for your comments. I hear very positive feedback from you and it is appreciated.